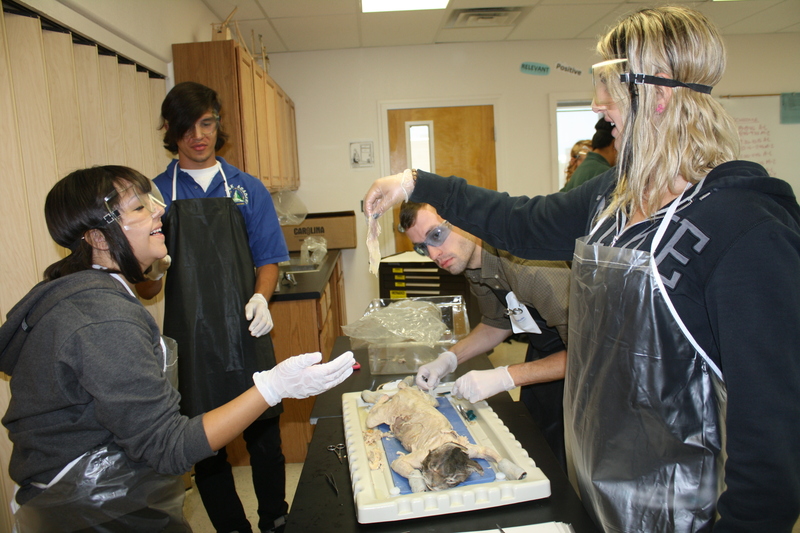 Dr. Osmond (second from the right) helps scholars identify parts of the cat’s digestive system. Looks like the cat is out of the bag – the past two weeks at the ASK Academy, Dr. Osmond’s Anatomy students have spent classtime elbow-deep in cat carcasses. The anatomy class will finish cat dissections today with a practical exam, which will include the actual cats that the scholars have dissected. Osmond said one of the expectations of the dissection include understanding appearance of different tissues, the approximate location, muscle arrangement, and motions of the muscles. “Cats are the most anatomically accurate to our bodies; they are the most closely related to us structurally,” he said. We look so stylish in our science safety gear! Oh how I never missed the smell of death and decay and or chemicals in the hallway. It is what makes our school, well, our school. Thank goodness! Walking into the building every morning and smelling those chemicals was terrible. I am very happy that the cats are gone…I hope that they took the scent of preservatives with them. I appreciate the effort on the part of our managers to give us “hands-on” experiences, but I prefer scentless robots. thus my senses return to normal!!! I remember doing the cats a few years ago. It was fun and very interesting i wouldn’t mind to do it again.